Sarajevo Open Centre, at the proposal of Feđa Bobić, raises the initiative to the Tuzla Canton Assembly to name the Tuzla International Airport after the first woman pilot in Bosnia and Herzegovina – Fatima Mušić. 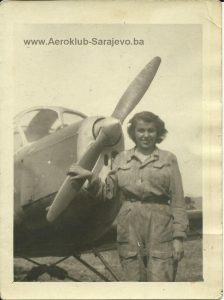 Fatima Mušić, later married surname Manojlović, has been the first woman pilot in Bosnia and Herzegovina. She has been a member of the Sarajevo Aeroclub since 1948; she completed her education within the First class of the Sarajevo Aeroclub Pilot School, and got her diploma on 11 September 1950 – and successfully finished the school after 95 flights. The Sarajevo Aeroclub has, over the previous years, been collecting data on their members, and here we name just a few of the excellent women pilots who were considered to be better than their male colleagues. Those names include: Zlata Hadžiabdić, Milena Blagojević, Judita Bušić, Miranda Čičak, Vojka Marić, Ines Martinović and others. We think that naming the Tuzla Airport after the first woman pilot, Fatima Mušić, would be a great opportunity to symbolically raise the voice in the struggle against forgetting and neglecting the work, efforts and contributions of significant Bosnian-Herzegovinian women of our culture, science, sports, arts and society as a whole.